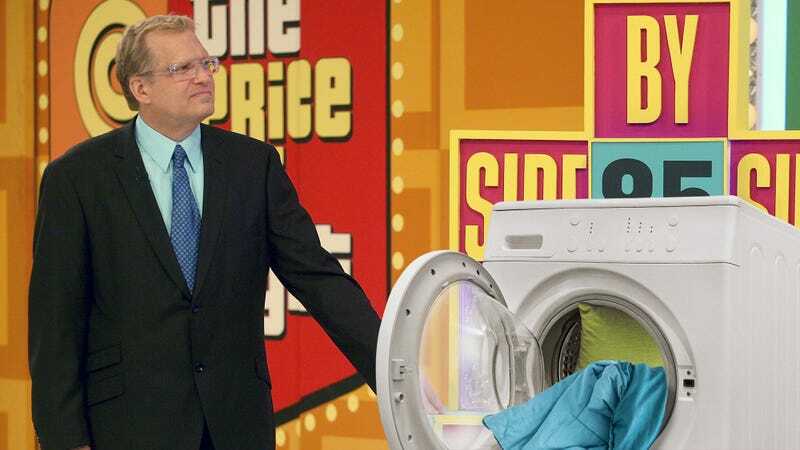 Anyone who’s seen The Price Is Right knows that the popular guessing game provides its fair share of highs and lows, but last night’s episode had to be the most heartbreaking one yet: A contestant on the show won a dryer that Drew Carey has clearly been living in. Oof. What a downer. Let’s hope Drew has some family or friends he can stay with for a bit, because if not, he’s in a tough spot. Last night’s otherwise upbeat Price Is Right episode turned dark when Carey introduced a segment during which contestant Patricia Bremer guessed the correct price of $1,575 for an LG front-load washer-and-dryer combo unit. Carey, looking visibly deflated after the win, remained uncharacteristically quiet for a long moment before muttering “Where the hell am I gonna live now?” under his breath while his eyes welled up with tears. After 10 seconds, with no further cue from Carey, the show’s theme music started up, letting Patricia know she had won the appliance set. Carey then ignored Patricia’s attempt at a double high-five and instead wordlessly went over to open the dryer, where he pulled out a pillow, a nightlight, and some books and dejectedly dropped them off the side of the stage into a pile. Wow. What a heartbreaking moment and a truly devastating insight into Carey’s living situation. Once Carey returned to his normal spot on stage, things were looking up as he finally acknowledged Patricia and congratulated her on the win. But the scene soon became even more tragic when Carey began inspecting the kitchenette set that Patricia was getting ready to guess on next, presumably to see if he could potentially live in there instead. As luck would have it, Patricia guessed correctly and won the kitchen set as well, leaving Carey looking even more anguished than he did before. Oof. Most people watch The Price Is Right as a lighthearted distraction from daily life, but this episode got all too real. Unfortunately, that’s just the way the game goes sometimes. All we can do is keep watching and cross our fingers that Drew Carey can find a new home soon.